A proven program for enhancing students' thinking and comprehension abilities Visible Thinking is a research-based approach to teaching thinking, begun at Harvard's Project Zero, that develops students' thinking dispositions, while at the same time deepening their understanding of the topics they study. Rather than a set of fixed lessons, Visible Thinking is a varied collection of practices, including thinking routines?small sets of questions or a short sequence of steps?as well as the documentation of student thinking. Using this process thinking becomes visible as the students' different viewpoints are expressed, documented, discussed and reflected upon. * Helps direct student thinking and structure classroom discussion * Can be applied with students at all grade levels and in all content areas * Includes easy-to-implement classroom strategies The book also comes with a DVD of video clips featuring Visible Thinking in practice in different classrooms. How can classrooms become places of intellectual stimulation where learning is viewed not in test scores but in the development of individuals who can think, plan, create, question, and engage independently as learners? Making Thinking Visible offers educators research-based solutions for creating just such cultures of thinking. This innovative book unravels the mysteries of thinking and its connection to understanding and engagement. It then takes readers inside diverse learning environments to show how thinking can be made visible at any grade level and across all subject areas through the use of effective questioning, listening, documentation, and facilitative structures called thinking routines. These routines, designed by researchers at Project Zero at Harvard, scaffold and support one's thinking. By applying these processes, thinking becomes visible as learners' ideas are expressed, discussed, and reflected upon. 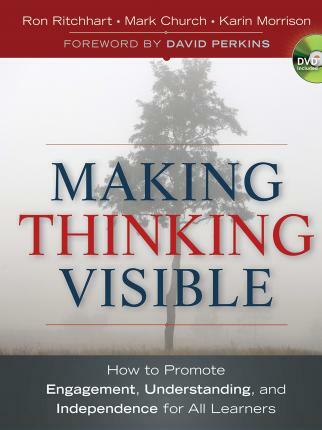 Making Thinking Visible includes a DVD of instructive video clips featuring visible thinking strategies being applied in a variety of classrooms. "There is a worldwide movement afoot to make the development of the intellect a priority for education in the twenty-first century. This book will become a landmark in that journey." "Making Thinking Visible is essential reading for every educator who strives to provide students with the skills they need to become thoughtful and enthusiastic directors of their own learning." "When thinking is made visible, learning is inevitable. Making Thinking Visible invites the reader to craft a new definition of education and presents a dramatic leap forward for education." Ron Ritchhart, Ed.D. is a senior researcher at Project Zero, Harvard Graduate School of Education. He is the author of Intellectual Character from Jossey-Bass. Mark Church is the Learning, Assessment, and Instructional Resource Supervisor for the Traverse City Area Public Schools in Michigan. Karin Morrison is director of The Development Centre at Independent Schools Victoria, Australia and instructor for the WIDE World online course, Making Thinking Visible, at Harvard.